Professor Kishore discusses the findings of the study. 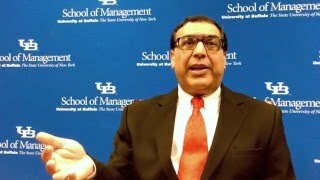 BUFFALO, N.Y. — Companies may strategically use corruption to gain a competitive advantage against rivals, according to a new study of formally registered Indian technology firms conducted by the University at Buffalo School of Management. Forthcoming in Strategic Management Journal, results of the study show that contrary to the notion that entire countries or companies may be culturally corrupt, firms pick and choose when to ignore laws and regulations and pay bribes to government officials to compete with smaller rivals who are not formally registered. The local companies didn’t engage in corruption in all situations, however. According to the study, when the formally registered Indian companies were competing with foreign multinational corporations, they chose to train their employees instead of engaging in corruption. For U.S.-based companies entering the Indian tech marketplace, the researchers say that lower-cost, easier-to-produce products are the way to go. The study analyzed a World Bank survey of 360 formal Indian IT firms with information on firm age, diversification, number of employees, patenting activity, advertisement activity, public or private status, foreign ownership share, access to public infrastructure and finance, as well as senior managers’ perceptions and reports of competitive threats, government policies and regulations, informal gifts or payments expected or requested by government officials, and training provided by their firms to their employees. Kishore and Talukdar collaborated on the project with Akie Iriyama, PhD, associate professor at the Waseda University Graduate School of Commerce in Tokyo, Japan.